This scenario explores how trainee teachers use mobile devices to support data collection during fieldwork. The scenario takes place in Helmsley, a small British town. The trainees were asked to measure the sound levels at number of places in the town using their devices and a noise measuring application. The scenario illustrates how mobile technologies can be used in a situated context where the students collect and interpret data using the tools on the device and some installed apps. 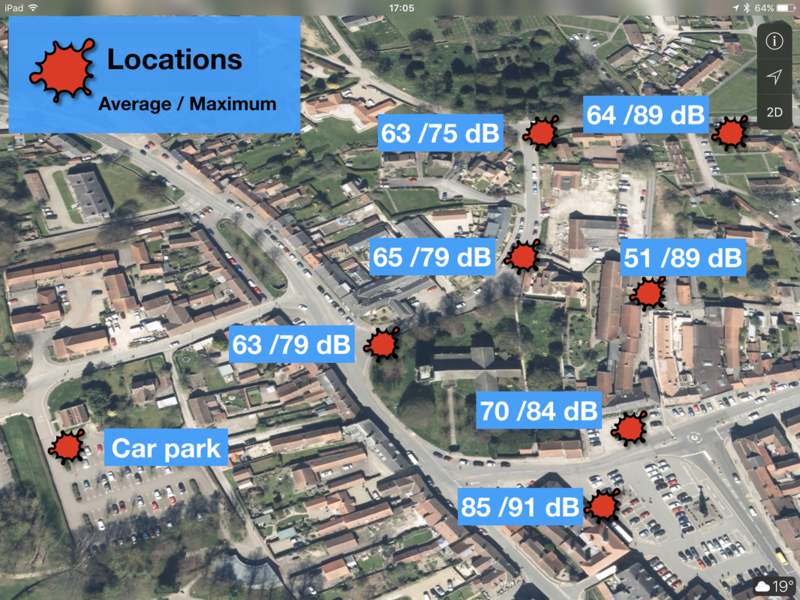 In the town the students measured the average and the high peak of the noise in several locations. After sharing their data they built a "map of noise" showing these levels (see opposite). What the places of interest? How many measurement points are needed? How long do they make a measurement? How often should you repeat the measurement? ​They also have to consider the accuracy and reliability of the noise measuring application that they are using. The students were able to explore the different noise levels how these were being produced - also to consider how this might impact on the quality of life for the inhabitants. They were also able to explore how different noise sources had differing decibel levels. The collection of data in real-time is an important part of field work in science and environmental studies. Students were able to also consider the variability and accuracy of data collection tools and how they could compensate for this in their data collection and recording. How could this scenario be extended? Identify an oasis of calm in your own city: Here you are needed first to make a election of places in the city, that are suspected to be calm. Identify the sources of noise: Noise is a result of active sources but also of the space around the source (reverberation). This could help plan for better spaces in the students' institutions. Measured noise versus felt-noise: Different types of noise with the same dB-level will result in different feelings of disturbance. So a net with datapoint of the felt noise can be compared with a net of physically measured noise. In this scenario it's necessary to collect the points as a mean of the group due to the differences of the feelings of humans. Extreme values of the differences should be explored. Jon Hoem (Western University of Norway, Bergen, Norway); Seán Ó Grádaig (School of Education, NUI Galway, Republic of Ireland); Mutfried Hartmann (Pedagogical University of Karlsruhe, Germany); Frank Thissen (Stuttgart Media University Stuttgart, Germany). Please let us know what you think about this video scenario. Was it helpful for you in your context? NOTICE: This project has been funded with support from the European Commission. This website reflects the views only of the project team and the Commission cannot be held responsible for any use which may be made of the information contained therein.